Total exports of the delicacy from Scotland amount to $1.3 billion a year. The United States is now by far the largest market for Scotch whisky in the world, according to recently released data. An analysis of official figures from the U.K. government by the Scotch Whisky Association (SWA) found that exports to the U.S were worth $1.3 billion in 2018, a 12.8 percent rise from the previous year. The next biggest market was France, at about $568 million. Overall, total exports of the Highland delicacy grew by 7.8 percent by value in 2018, per the report. Although the United States was the biggest export market by value, the SWA report actually shows that France is the largest export destination by volume. While the U.S. received the equivalent of about 137 million 24 fluid ounce bottles in 2018, France received about 188 million bottles. 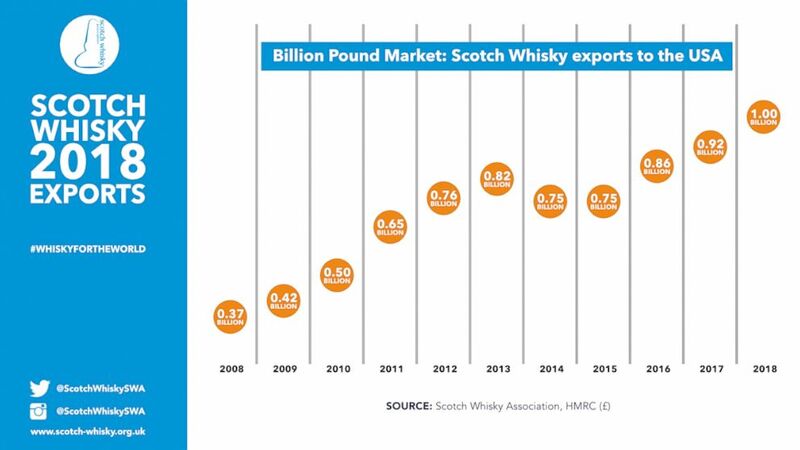 (Scotch Whiskey Association (SWA)) Graphic showing the export market for scotch whiskey to the U.S. in British pounds from 2008-2018. Globally, exports of Scotch whisky are now worth over $6 billion. Blended Scotch whisky is the foundation of the industry, with exports worth $3.8 billion, while Single Malt Scotch grew 11.3 percent in 2018 to about $1.8 billion. LISTEN: Our Chief Executive @KarenEBetts is on @BBCr4today with @dominicoc to discuss our 2018 #ScotchWhisky export figures. Scotch whisky must be produced in Scotland, according to U.K. law. The law also says there are five definitive categories of Scotch whisky: Single Malt, Single Grain, Blended, Blended Malt and Blended Grain. The data came as no surprise to the SWA’s international director, Sarah Dickson. "The U.S. has a long-standing love affair with Scotch Whisky, and in the week of Valentine's Day that desire seems to be growing,” she told ABC News in an email. "Scotch Whisky has been enjoyed in the U.S. for more than 150 years, with whisky pioneers like James Buchanan, Tommy Dewar and Alexander Walker taking Scotch out into the world. 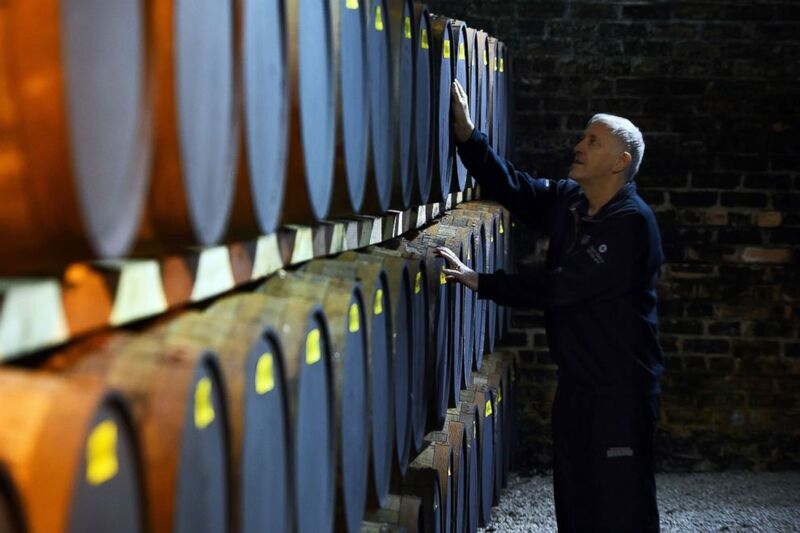 Today, brands named in their families' honour are still enjoyed by millions across the U.S."
(Andy Buchanan/AFP/Getty Images) Nigel Baker checks on oak barrels of whisky being stored before bottling, at the Auchentoshan Distillery near Glasgow, Scotland, Feb. 28, 2018. "U.S. consumers know their whisky, and from Bourbon to Rye to Irish, more and more are enjoying a Scotch Whisky on their whisky journey," she added. The report released by the SWA did come with a warning to U.K. lawmakers that Brexit could have a negative impact on the lucrative trade, but Dickson believes that transatlantic trade in Scotch whisky will continue as normal after the U.K. leaves the European Union. "Last week the US-UK Spirits Agreement was signed -- good news for Scotland's national drink, giving Scotch Whisky continued legal recognition in our largest global market," she said. "This will help ensure that U.S. consumers can continue to enjoy Scotch Whisky post-Brexit."